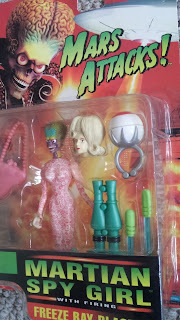 She's Fantastic: Women of Halloween Part 10 - MARTIAN SPY GIRL! Here she is with her accessories. Her raygun fits inside her purse. Her giant missle launcher is silly and come with two launching missles (only one shown). She also came with a Eyeball Spy Ring accessory for you to wear. And, of course, her removeable human head! 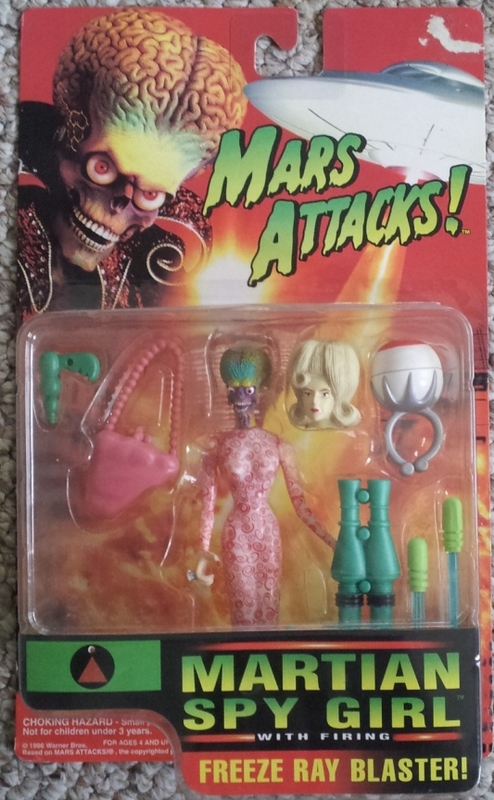 I love how freaky the Martians look. If they weren't so comical they'd be terrifying. Note that she has a button on her lower skirt (on the front, just before it flairs out) to activate a sound feature with corresponding sound holes around back. My figure's button is fused in place, as if the plastic was never properly punched out. Not sure what she was supposed to say (since she didn't talk in the movie), but I'm sure it was amusing. I currently have this figure. You push the button once and she'll say "Ack Ack." Push the button again and she'll say "Take me to your leader!" Awesome thanks for the info! 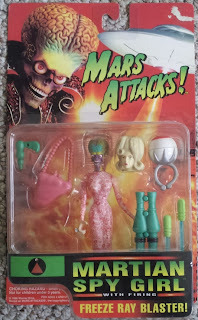 The "Ack Ack" line all the martians say is hilarious. I remember seeing it in the theatre (when I was much younger obviously) and the "Ack ack" becoming a part of the random joking banter among my friends. I'm glad of all the phrases to give her they chose that one.